Love all the strips on this fun layout! Cute title. Those Santa's are really neat! Such cute background paper for inspiration! I love the simplicity! This is so cute, Amanda! I love this so much I marked it as a favorite! Love the negative space and just bits of Christmas colors. This is just perfect! Really cute page with really cute photos. Adorable photos and layout. Love the design! 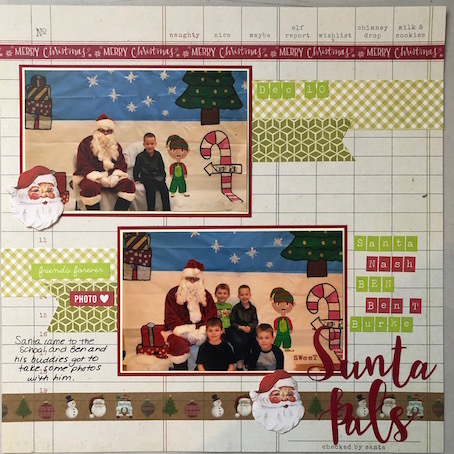 Such cute photos with Santa..adorable Christmas page Amanda! so fun! Love the pictures of the kids with Santa! Love the title work and embellies! What a fun and playful Christmas page! Great job with this! Love your fussy cutting and the strips of pp!